This is one of my favorite Beast Bowls to date! 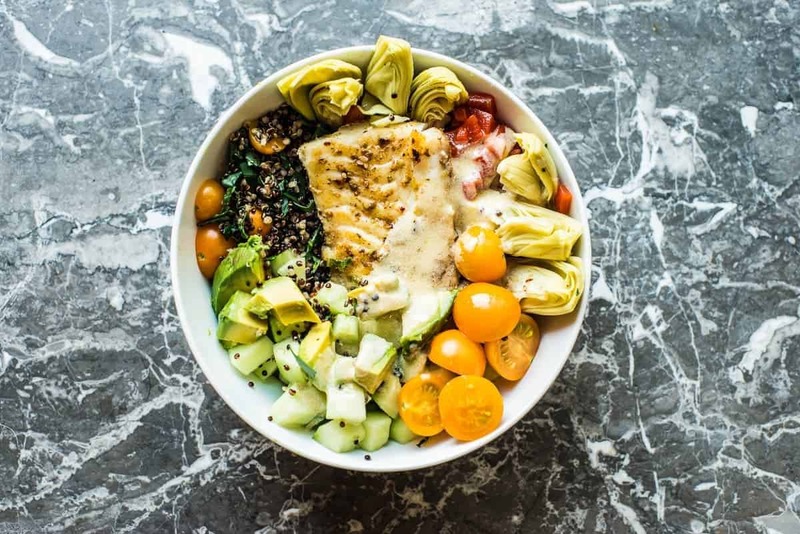 With quinoa and a flavorful lemon tahini dressing, this Mediterranean Beast Bowl is sure to be one of your favorites, too. I used fish this time, but chicken would also be fantastic in this Beast Bowl. For the vegan version, I used tofu with the same spices. My daughter loved it. If you’ve been hanging out here for any time at all you already know that I love creating spice mixes. Having spice mixes around makes whipping up tasty meals super easy. They’re also a bit like an idea board. When I’m stuck and can’t figure out what to make for dinner, I open up my cabinet with all my spice mixes and wait for the inspiration to hit. This Beast Bowl uses my Mediterranean Spice Mix. (You can get a copy of our 5 favorite spice recipes here.) I use this spice mix on any kind of fish. My top 3 favorite varieties are Mahi-Mahi, Salmon, and Cod. This Mediterranean spice mix is also ridiculously tasty on chicken. 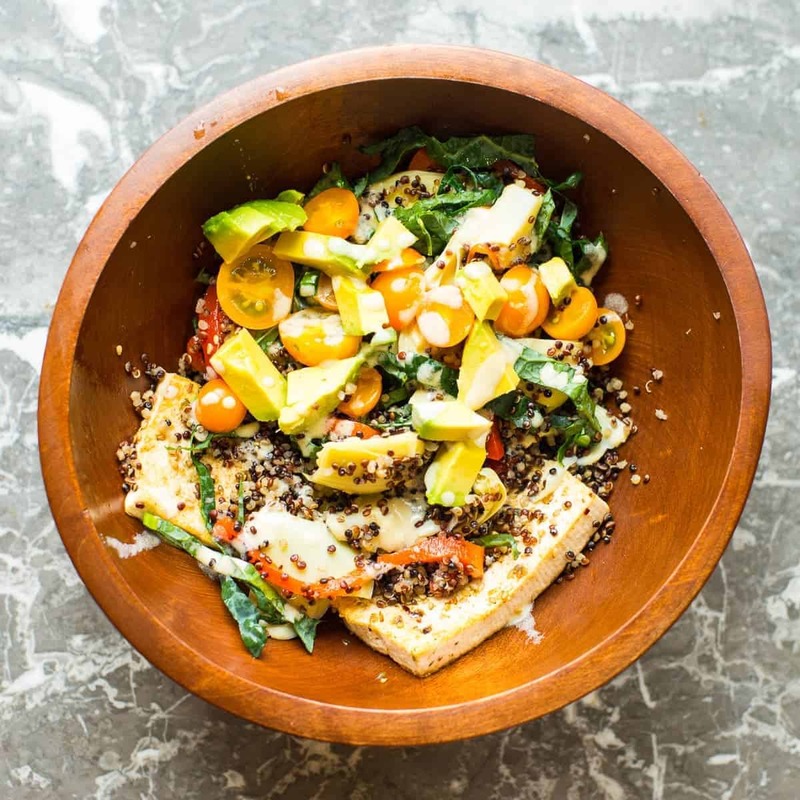 The base of this bowl is made up of rainbow quinoa mixed with chopped lacinato kale. Add to that about 4-6 ounces of your favorite protein cooked with the Mediterranean Spice Mix. 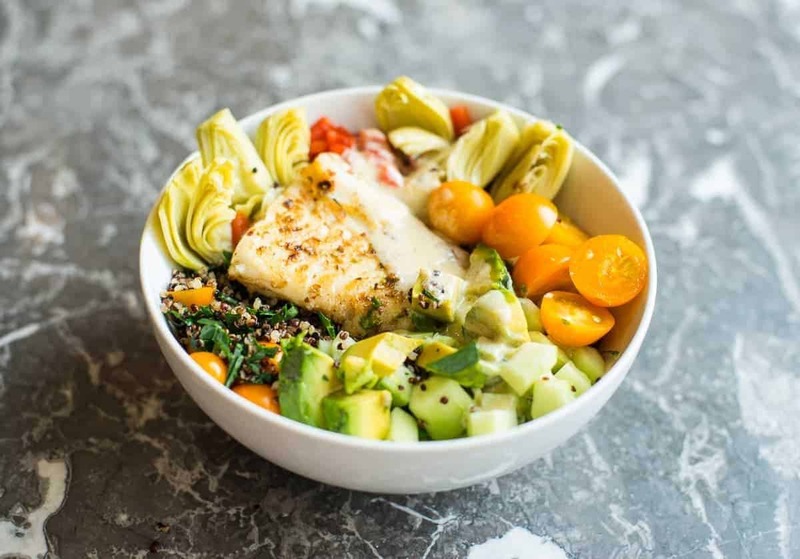 Top your beast bowl off with fresh juicy tomatoes, cucumbers, artichoke hearts, roasted red peppers and a nice drizzle of tasty lemon tahini dressing. Here is the vegan version: My daughter…we call her Bean…eats almost everything in this wooden bowl. [This bowl even looks nourishing, doesn’t it?!] For her bowl the preparation is the same. Except – for the protein, I just browned some tofu in a little bit of olive oil after rubbing it with the Mediterranean spice mix. Every time I make a Beast Bowl I am reminded of why I started eating this way. It is easy, nutritious – and most importantly – a truly delicious way to get a healthy balanced meal. I hope you can find inspiration here to build your own Beast Bowl mashups. Once you get used to the basics, you can easily adapt to this way of eating to any meal. With some practice, Beast Bowl eating takes much of the prep work out of your daily food planning and cooking. I hope you love this Beast Bowl as much as I do. If you do, please share it with a friend. Sharing really helps us at Beast Bowls spread the word about easy and healthy eating. It is our goal to make food prep easier so that we can all eat a little healthier. If you haven’t gotten ahold of our secret time saving kitchen secret. Make sure you grab a copy today! Cook fish in a saute pan or in the oven. Add more water if needed to achieve desired consistency. Vegan Adaptable: Use slices of extra film tofu instead of the fish. Chicken may also be used instead of fish. This looks delicious! Where did you get Bean’s wooden bowl? I recently purchased a melamine bowl from Cost Plus for my beast bowls and while it is adorable, I’d prefer a wooden bowl.